And... this is about all the pictures we have from Thanksgiving last year lol. 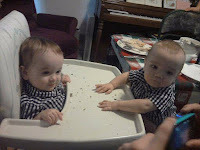 I felt awful that we didn't take any pictures of the twins first Thanksgiving. It was just so busy and with two babies to keep happy and feed, I just never remembered to pull out the camera. We went to Hubby's brother's house. The food was yummy and we got to meet more of my brother-in-law's in-laws. This pic was taken a few days later at Grandma Cindy's. We had a little mini Thanksgiving before we headed back home. The babies loved the stuffing and having Grandma share with them.